The National Priorities Project (NPP), a non-profit, non-partisan research organization dedicated to making the federal budget process transparent, released Competing Visions on Friday. The report compares how each budget proposal responds (or not) to the stated policy priorities of the American people, on key issues including jobs, education, Social Security, Medicare and Medicaid, food assistance, and military spending, as well as proposed strategies for tax reform and deficit reduction. 68 percent of Americans think wealthy households don’t pay enough in taxes. The Obama budget proposal raises top capital gains tax rate to 28 percent and closes the “trust fund loophole” that allows heirs to avoid taxation, raising $208 billion over 10 years. Places limits on tax deductions for top income earners and implements the Buffett Rule ensuring a minimum tax rate for the wealthy. Places limits on tax deductions for top income earners and ends the “carried interest” loophole that benefits hedge fund managers to raise $17.6 billion over 10 years. The House budget calls for comprehensive tax reform that would lower tax rates for individuals and families. Closes some special interest tax loopholes but does not specify which ones. Eliminates the Alternative Minimum Tax that sets a minimum tax for the wealthy. The Senate budget contains no proposed changes to the status quo. The CPC proposal raises tax rates for richest 2 percent (earning more than $250,000 per year) to Clinton-era levels, and taxes capital gains investment earnings at higher rates, yielding $1.4 trillion in additional revenue over 10 years. Places a cap on the value of itemized deductions that mostly benefit the wealthy (raising $566 billion over 10 years) and limits other tax deductions for top income earners. Similar discrepancies exist on almost every issue. While 70 percent of Americans oppose cuts to food stamps, the House and Senate budget plans would both cut the program. Overall, the House Republican budget would cut $5 trillion in government spending over the next decade, mostly out of programs that low- and moderate-income Americans need and depend on—and say they support. At the same time, it adds $400 million in defense spending—not in line with public opinion polls—and promises to lower tax rates for wealthy Americans and corporations. The Senate version follows the same basic outlines. At a Senate Budget Committee hearing on Wednesday, U.S. Sen. Bernie Sanders (I-Vt.) also noted the divergence between GOP policies and the priorities of the general public. Lawmakers should make targeted and smart Pentagon budget cuts. The watchword in Washington has been “cut” for some time. But the House of Representatives headed in the opposite direction when it adopted its version of the National Defense Authorization bill. 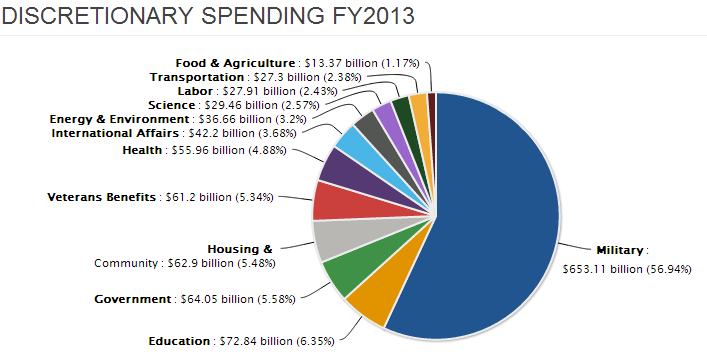 The bill authorizes $552 billion in military spending next year. That’s $54 billion more than what bipartisan majorities agreed to under current law in the Budget Control Act of 2011. The House also added $5 billion on top of the $80 billion the Pentagon requested for the Overseas Contingency Operations account, which covers war fighting. While the Pentagon is scaling back activities in Afghanistan, Congress wants to ramp up spending in this area. The bill is unlikely to become law, certainly not as written. President Barack Obama has already issued a veto threat and the Senate has a different (though still wasteful) approach. But that doesn’t mean that there won’t be significant negative consequences. Fantasy budgeting has a real impact when it crashes into reality. Instead of either living within the lower spending levels Congress already enacted or finding a fiscally responsible solution, lawmakers are approaching the situation like little children with hands over their ears yelling “I can’t hear you” repeatedly. Then — when the budget caps strike — lawmakers lament that cuts are not targeted or cut certain areas too deeply, when their inaction is what caused the impact. “I’m tired of living in a town where if you don’t like the rules, you find a way around them,” Representative Woodall (R-GA) observed. 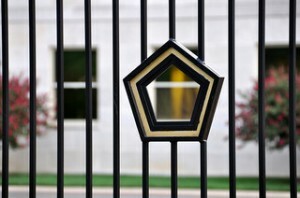 There were several amendments to help the Pentagon get its budgetary house in order. A proposed $60 billion cut would have brought the overall spending in line with the levels called for in the statute. Another amendment would have given the Pentagon the Overseas Contingency Operations budget it actually asked for without the extra $5 billion. One provision would have made the National Guard stop sponsoring NASCAR and professional wrestling. A measure would have let the Navy decide whether it wanted 10 or 11 aircraft carriers. There was an effort to reduce troop levels in Europe. An amendment would have mandated proving that the missile defense system being implemented in Alaska actually works before throwing more cash at it. The House leadership wouldn’t allow several pro-taxpayer amendments to be offered on the floor, including a measure that would cut funding for weapons systems the Pentagon doesn’t want and require our allies to bear a greater share of the costs of their security. Taxpayers deserve better. At the end of the nine year period of spending caps under the Budget Control Act, military spending will be at the level it was in 2007. Nobody seemed to think more than half a trillion dollars was too little defense spending then. It certainly wouldn’t be now. Instead of saving sacred military cows, lawmakers should make targeted and smart Pentagon budget cuts. Spending more won’t make us safer. But spending smarter will make us stronger. Why Use a Bludgeon When a Calculator Will Do? Some lawmakers have an almost-mythical resistance to raising revenue at a moment when affluent individuals and big corporations have the lowest tax burden in more than half a century. It’s as if the American people are being squeezed into the back of a dilapidated Chevy pickup. Careening down a dirt road, we’re headed for a brick wall. Try as we might to wake up from this nightmare, we can’t stop the truck. That sounds frightening, and it is. Once sequestration kicks in, we’ll feel the impact of approximately $85 billion in automatic, across-the-board federal cuts focused almost exclusively on discretionary spending. Designed as the ultimate penalty — a bludgeon when what’s called for is a calculator — sequestration was supposed to force members of Congress to work together within a deficit reduction paradigm. It failed as a disciplinary measure for our lawmakers and it’s looking more likely to fail us all, especially the most vulnerable and marginalized Americans. Discretionary budget cuts aren’t equal. As legislated, sequestration slashes more or less evenly from what’s known as defense and non-defense discretionary spending. That sounds fair on the surface but consider that — at 57 percent of all discretionary spending —Pentagon-related federal expenditures have risen 35 percent since 2002, 48 percent when you include war costs. 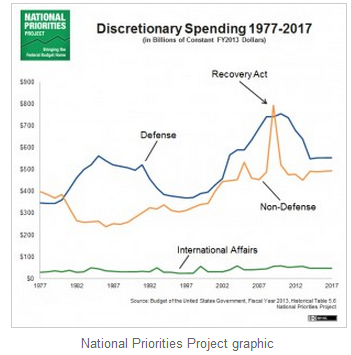 At the same time, non-military discretionary spending increased only eight percent, with notable reductions in funding for key social programs between 2010 and 2013. Unlike the audit-dodging Pentagon, which has drawn bipartisan criticism for waste and bad management, there’s no excess to trim. Sequester cuts to depleted social initiatives will mean less money flowing into state and local budgets, job loss, and the termination of services in sectors where there are already aching gaps between what’s needed and what’s offered. The needs won’t evaporate. The costs will shift to cash-strapped state and local governments in the form of property tax hikes and budget overrides. Consider the F-35 Joint Strike Fighter. While we’ve been splitting hairs over public dollars for food and roads, the F-35 has become the most costly weapons program in U.S. history due to setbacks and delays. The cost of just one of these jets (and 2,457 are on order this year) is nearly equal to the entire cut projected for Low Income Home Energy Assistance Program expected to take effect under sequestration. Further, budgets are about revenue and spending. Many in Congress believe that the pot of money to be spent or saved is finite. It isn’t. Yet, some members have an almost mythical resistance to raising revenue at a moment when affluent individuals and big corporations have the lowest tax burden in more than half a century. Prior to January 1, the top 1 percent of income earners got a bigger annual income-tax break than the bottom 99 percent earned on average each year. Members of Congress grudgingly let most of that benefit sunset at the end of 2012. As a result, we’ll see approximately $620 billion in additional revenue over the next decade. There’s more available. What about ending the Bush tax cuts for the second-richest one percent? And what about corporations? Officially, large U.S. companies are slated to pay a 35 percent tax on their profits. In practice, they pay nothing like that. In 2012, for example, corporate givebacks, loopholes, and overseas tax havens cost the Treasury $165 billion. We’d have a different national conversation right now if Congress would muster the political will to tackle tough questions like these. The bottom line is that sequestration upends democracy. Americans deserve better than government by crisis. Through our taxes, we’re the nation’s major bill payers. Sequestration robs us — and our lawmakers — of our right and responsibility to make nuanced, thoughtful decisions about the fate of our nation. We need a federal budget by the people, for the people.